Ok, let’s be honest. 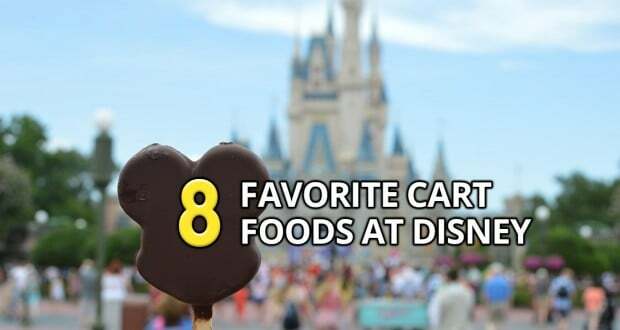 To say that there are only 8 favorite cart foods is a stretch. I could probably title this Top 100 Favorite Cart Foods and still have some left over. While riding teacups and giant elephants is fun, the thing I look forward to the most, and plan for the best is the FOOD at Disney. We are a bi-coastal Disney addict family, so I decided to share with you my top 4 from Disneyland Resort and 4 from Walt Disney World. I admit, just writing this has me excited for my next trip already. 4. Cinnamon Roll – Now there are a few of these around the park that are pretty good, but the absolute best is only available at the cart outside the Haunted Mansion. We smell the warm, gooey treats the minute we hit Tarzan’s treehouse and it’s like a beacon calling us home. Now make no mistake about it, one cinnamon roll could feed a small army, but they are worth every calorie. 3. Churros – Our favorite churro cart is in Bug’s Land. It is tucked away behind Heimlich’s Chew – Chew Train and hardly ever has a line. The churros at Disneyland are in a league of their own, and believe me, I have tried enough to know. They are always warm and fresh with the perfect crunchy to soft ratio. 2. Corn dogs – You may have heard about these Disneyland corn dogs, but until you have tried one, you aren’t living. The cart is at the end of Main Street, in front of the Plaza Inn. The line for the deep fried perfection on a stick starts first thing in the morning (corn dogs for breakfast anyone?) but they are worth the wait. We have made these a tradition for every trip because let’s face it, no one does it like Disney. 1. Dole Whips – In case you didn’t know, Disney has changed the way we think about Pineapple soft serve. People have even started fan clubs for these things. We visit the cart right outside the Tiki Room for these one of kind cool treats. They have the best fruity flavor with chunks of actual pineapple inside. On a hot California day, there is nothing better than a Dole Whip. As an insider tip, if the line outside the Tiki room is too long, go right around the corner inside the Tiki room. There is hardly ever a line inside and if there is, there is some entertaining birds to pass the time. 4. Mickey Bars – I am pretty sure that we have visited every possible Mickey Bar/Ice cream cart in all 4 parks. We have probably also left a chocolate stain on the shirts we wear on those visits. The Mickey Bar is by far one of the best cold treats, and believe me, Florida in June makes you want to get in the ice cream cart. The chocolate shell is smooth and sweet and usually best eaten if peeled off the vanilla ice cream first. Yes, I tend to take apart my Mickey Bar, but only because I want it to last longer. 3. Turkey Leg – All I have to say is “How big were these Turkeys?” Our family of 4 easily makes a meal out of 2 turkey legs. Our favorite place to grab one is in Hollywood Studios at the Fairfax Fare booth. They are always juicy and tender and we may have been known to eat them for lunch and dinner. We especially loved them when they counted as a snack credit on the Disney Dining, but they have since changed that. 2. Crepes – Now we just found these on our last visit this June and boy have we been missing out. The little cart is located in the France area (duh, right?) of Epcot. They make them as you order them and they have several different toppings to pick from. I feel bad for my husband, he ordered a chocolate one for him and after the 3 of us all “tried” it, he had to go back and get another one. Yes, they are THAT good. 1. Cream Cheese Pretzels – I struggled with including this on my list and letting everyone know how amazing these are because then the lines just get longer. Then I realized it was my duty to all pretzel lovers to share what my family calls the BEST pretzel ever. The pretzel stand we visit is in Hollywood Studios and is growing in popularity as we speak…or as we read. These pretzels are served warm and are filled with cream cheese or jalapeno cream cheese that oozes out when you take a bite. These soft, chewy filled treats are literally why I diet a week before any Disney World trip. Believe me, this article only touches on a few of the delicious cart foods available, but if you need a place to start, then this is the way to go. If you need a partner, feel free to call me up. I’m ready to eat, I mean, visit Disney any day. Happy Eating!